At IdealShape, we know that small changes can equal big results. That’s why we created the 90-Day Weight Loss Bundle! If you’re able to effectively combat hunger while controlling calories, you will find success on your weight loss journey! I love these products! It's an excellent way to try multiple flavors and have stock. I love following this program and it has definitely helped! 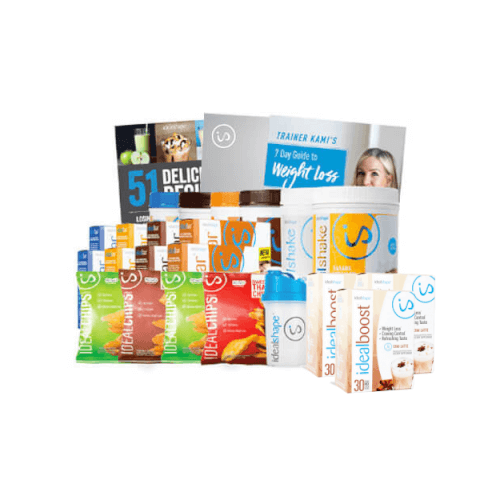 This is an amazing price on all this and better yet its am amazing shake. I have tired them all out there on the market 3x's the price and Walmart specials and to be honest they all taste like cardboard. I saw this one on a blog and thought I would try one more time. I am so glad I did!! These have a smooth texture ..no lumps no sanding taste and the are so good tasting. I have lost 17 lbs since I started and Hubby has lost 21. We eat a healthy breakfast, shake for break and bar for lunch and a healthy dinner. I found a great way to carry the power with us using a baby formula holder! I have been using the ideal shakes and boost off and on for 6 months. Love the shakes, they are very creamy and good taste. I love love love the ideal boost packets. completely gave up pop and with the boosts I have not missed it at all. I did loose 38 pounds with shakes and sensible diet. fell off the track with the end of summer but ready to get back in line. cant wait to try the bars also.